Located in the Civic Center of Denver, CO, the Denver Art Museum is a striking building housing some seriously impressive artwork. Recently, they’ve had the honor of presenting a temporary exhibit called “Passport to Paris,” which includes three exhibitions of French art from the late 1600s to early 1900s. I had the opportunity to visit the exhibits, and I can honestly say that the Denver Art Museum put together a wonderful show that’s definitely worth the trip. 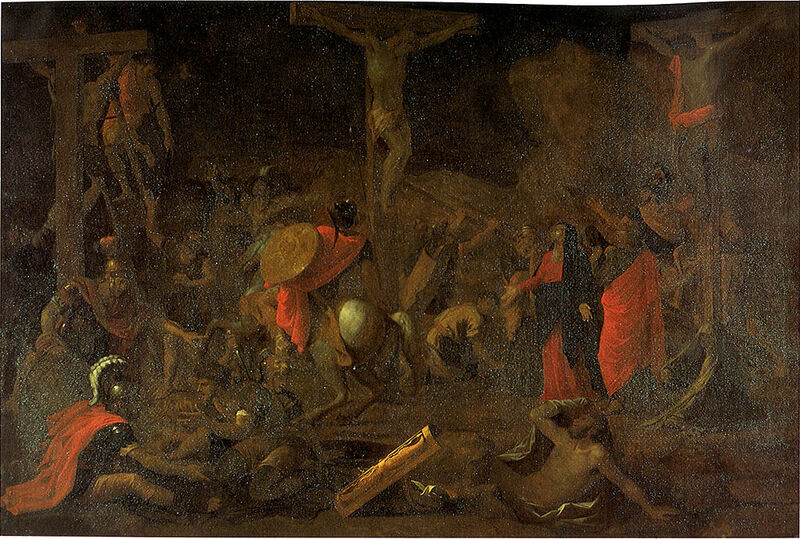 The “Passport to Paris” exhibit at the Denver Art Museum includes three shows – Nicolas Poussin’s “Crucifixion” is part of the “Court to Cafe” collection. Borrowed from Wadsworth Atheneum, this 50 painting tour through the centuries is the main attraction of “Passport to Paris.” We had to reserve a tour time and purchase our tickets online before arriving at our specified time. The slots fill up fast, so following this step is crucial to getting into the tour. Even though we were there on a weekday afternoon, it was quite crowded. They gave us individual audio guides for the walk-through, and we were free to wander through three centuries of French art at our leisure. The exhibit is purposefully set up to give the viewer a glimpse into each time period, showing the progression of artistic style through the ages. The Denver Art Museum put a lot of effort into creating an experience as you move through the stylized space. Speakers playing music from the time period being represented are strategically placed throughout, paintings are paired with gorgeous furniture pieces and clothing from their eras, and even the wallpaper behind the paintings mimics the designs of the time. The audio guide helpfully explains how art progressed from formal, darker depictions like Nicolas Poussin’s “Crucifiction” to airy, light outdoor scenes like “The Beach at Trouville” by Claude Monet. Artists began breaking the traditional rules of painting during the Impressionist era, taking their easels to paint outdoors rather than inside stuffy studios like their predecessors. The resulting artwork capturing natural landscapes in vivid colors without lines was entirely new to the art world. 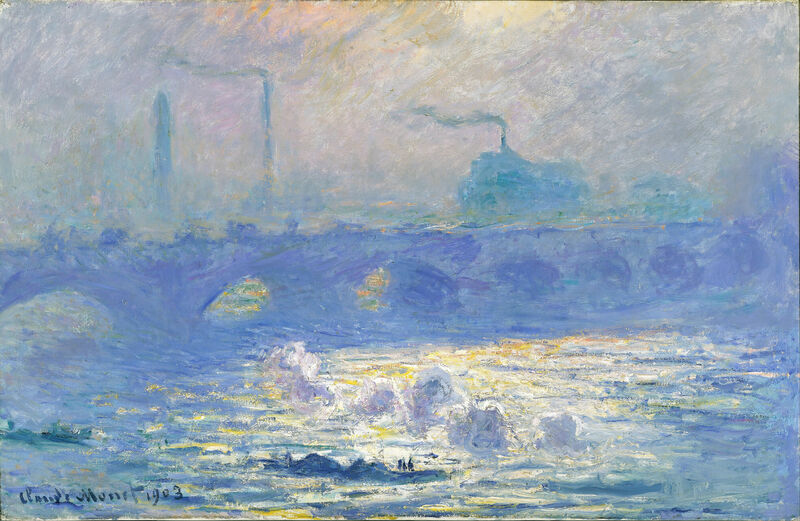 Claude Monet’s “Waterloo Bridge, Sunlight Effect” is one Impressionist painting in the “Nature as Muse” exhibit. This collection of 36 French landscape paintings is a quicker walk-through than the elaborate “Court to Café,” but you could spend a lot more time just staring at the incredible paintings presented here. These are big name painters, some of the most famous in the world, Claude Monet, Vincent van Gogh, Edouard Manet, Camille Pissarro, Pierre-Auguste Renoir, to name a few. The Denver Art Museum director, Christoph Heinrich, put this exhibit together from the museum’s permanent collection and works owned by Frederic C. Hamilton. As Ray Mark Rinaldi of The Denver Post puts it, the “Nature as Muse” is a more intimate, scalable look at the progression of French art from the 1600s to the era of Impressionism. The narrowed subject matter, namely landscapes, makes it easier to see the changes of artistic style through time. 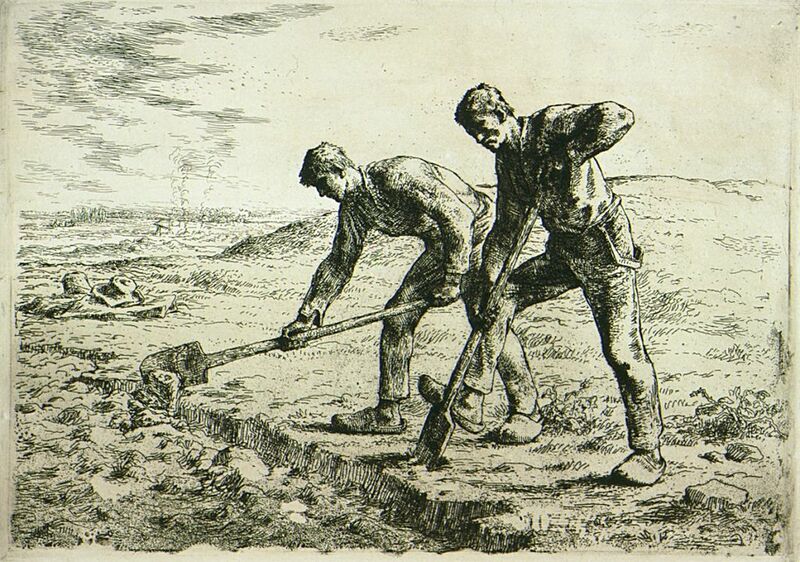 Jean-François Millet’s delicate drawing, “The Diggers,” is part of the “Drawing Room” exhibit. By far and away my favorite exhibit was the “Drawing Room” – a collection of 39 works on paper in media like various colors of ink, pastels, graphite, chalk, and even crayon. The pieces are arranged in backlit glass cases and show French art in a completely different way than the rest of the show. Bent over the small scale artwork, you can get a close look at how immensely talented these artists truly were. A few strokes of a pen can produce a picture of such detail that it takes your breath away. The Denver Art Museum has put together an incredible show. If you are lucky enough to see it before it is over, plan to spend a little more time than you think because it is a collection well worth a second and even a third look. I am a multifaceted writer and storyteller. I specialize in business communications and website content with a strong background in sales and marketing. I grew up in Las Vegas, but now I live in beautiful Colorado with my husband and small zoo of two cats and two very spoiled Miniature Schnauzers.